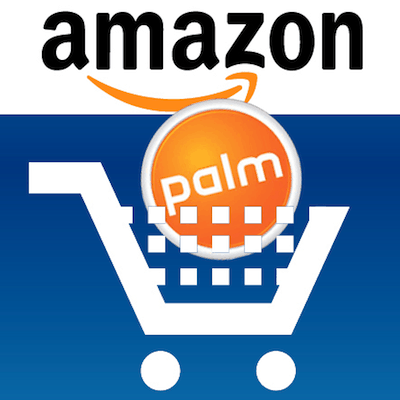 There's a rumor going around today that Amazon are in talks to buy the defunct remains of Palm from HP. I think it's true. VentureBeat are reporting that HP are trying to find a buyer for the corpse that was Palm. After putting over a billion into buying Palm and nearly another billion into developing new hardware, HP are problaby looking for someone to take the embarrassment off their hands. Indeed, no other company seems as fitting a home for Palm and its webOS software. It’s worth noting that former Palm CEO Jon Rubinstein, who now holds a vague “product innovation” role at HP’s Personal Services Group, joined Amazon’s board late last year. Now, I usually hate covering gossip like this and I know that I will almost always disbelieve the rumors. But this is one that I expect to happen. Buying webOS will give Amazon what they always wanted: control. Once Amazon own it, webOS will be dropped by all the other major ebook companies and any startups will probably think twice about competing on Amazon's turf. Amazon can restrict who gets to develop what on their platform. And unlike Android, they won't have to worry much about unapproved apps. In case it's not clear, Amazon want to Apple and own something like iOS. (That is certainly what they tried to do with the Kindle Store.) Amazon want webOS because its something that they won't have to share with anyone. Don't believe me? Look at what they've done with Mobipocket. Amazon bought Mobipocket, an ecosystem with library ebooks, competing retailers, and an existing customer base, and then proceeded to kill it off and create the Kindle. And yes, Mobipocket is all but dead. Amazon tightened control over how readers could use ebooks, eliminated the possibility of competing retailers, and pushed away all the existing customers. They have also periodically changed the DRM and occasionally hidden details to make hacking the format harder. There's no guarantee that this deal will come to pass, but I certainly believe that this rumor is true. WebOS would be a dream come true for Amazon. Parts Cost Shows that the Kindle Fire Sells for Less than Cost – or Does it? I’m in agreement. Amazon is probably the best home for WebOS. Amazon might buy webOS, but it’s not the “best home” for webOS if what you want is a viable, on-going smartphone/tablet product and ecosystem. webOS will simply be what Android is to the Fire–the guts, completely Amazon-ized and limited to doing precisely what Amazon wants the device to do. For example, if Amazon buys webOS, then first thing we can expect is for them to lock it down and send a cease-and-desist letter to webOSinternals. No more hacking, patching, etc. Consider the Fire: it’s NOT a competitive tablet, and isn’t supposed to be. It’s a great modern PMP, and that’s about it. I mean, seriously: without a microphone and camera(s), it is severely limited right out of the gate vs. “real” tablets, and that’s just fine with Amazon’s purposes. So, yes, I agree 100% that Amazon could and very possibly will buy webOS, but it’s the death of the platform as far as today’s webOS fans should be concerned. Yep. Amazon owning webOS would not necessarily be good for the end-user or the tech buff. I can’t imagine Amazon wanting that albatross webOS for $1 billion (or less) when it can have Android updates for free. Amazon can keep its own developers busy tweaking their environment to run on standard Android hardware and “refresh” the underlying layer, from time to time, to take advantage of hardware changes in the wild … with webOS they’d have to continually invest in OS / hardware integration. Longer term, Amazon is about content and storefront; hardware is a means to an end. Kindle Fire sold at manufacturing cost makes sense … because the thing “can’t go” without Amazon content so they have a “guaranteed” revenue steam from day one. In today’s world, control is spelled PATENTS. Android is clouded by patent issues, just made stronger by Samsung agreeing to pay Microsoft to license their patents. It’s unclear whether the cross-licensing agreements that Amazon and Microsoft have cover the Android patents that Microsoft claims, and Amazon hates, hates, hates to send a penny to any other company for its products. It’s not clear to me how easy it would be to plug in WebOS in, considering the importance of having the whole ecosystem for a successful tablet, including third-party apps. But maybe the patents are worth it. But to clarify, there are no android patents infringing MS IP; rather MS is making the case that Android itself violates its patents. MS has already sued B&N over their use of Android in the Nook so if Amazon’s deal doesn’t cover those patents we’ll know shortly after Fire ships. Thing is, Amazon is a *major* player in Cloud computing so they have a lot of original IP in that area that is license-worthy so any conversations with MS over android are bound to be quiet and civil, unlike the B&N response. May I point out the obvious? If Amazon were to buy WebOS, even at a heavily discounted ($200m, say) it is to use it. Which means Amazon digging deeper into the gadget business to further promote their services businesses. So, the first question becomes: what gadget categories fit the Amazon toolkit and existing businesses? 2- Dirt-cheap smartphone, say $30-50 without contract, for the pay-as-you go crowd. Android is headed there but the IP issues and costs might prevent it. WebOS has no such overhead. 3- Streamer box for the TV. If Amazon is serious about Prime Video streaming they need to get it on TVs and I’m not sure partnerships alone will get them a bit enough share there. A second consequence of a push into digital gadgets is that Amazon would have to either replicate or buy parts (or all of) Yahoo. If they’re going to dumpster-dive, they might as well do it with gusto and if you are going to play in the consumer cloud business against Microsoft you’ll need to match their arsenal. Another fit for an outright buy: OnLive. I don’t totally buy the WebOS rumor, but I do see merit in it. And if they do pull the trigger, it’ll have follow-ups; WebOS by itself has limited value (hence its availability) but combined with the right services play it has its uses. Hi i think the deal will be really interesting for Amazon and for WebOs, i have a Touchpad and WebOs is so beautiful !! !